Globally recognized for their remarkable skill and attention to detail, the Zuni tribe is especially known for their enchanting fetish carvings. Fetishes are small carvings – often of animals – that are made from a variety of different materials indigenous to the region such as shell, bone, clay, or stone, with the most common being a soft stone called serpentine. The Zuni tribes have used fetishes for ceremonial and spiritual purposes as far back as 600 A.D., and today contemporary Zuni fetish jewelry and standalone fetishes continue to keep that fascinating tradition alive. We carry a wide variety of authentic standalone carvings, earrings, necklaces, and pendants that are hand carved by world-class Native American artists. Each animal has its own unique significance, so choose the one that speaks to you most, or collect them all. Our bestselling Zuni fetish jewelry offerings include beloved animals such as the bear, buffalo, turtle, fish, ram, frog, eagle, and many others. Browse our inventory with complete confidence, knowing that all of our high-quality fetishes are sourced from renowned artists from local Zuni tribes. Zuni fetish jewelry is both timeless and chic, and it lets you wear a piece of the past while still remaining fashion-forward. Our standalone fetishes also make fantastic decorations for your home mantle, your office desk, or anywhere else where you want to enjoy these stunning works of art. Fetishes provide a remarkably positive energy in any room, and being able to wear them is certainly a treat. In traditional Native American lore, each fetish animal is said to have its own inherent powers. For example, Navajo tribes often sought out figures of sheep, goats, cattle, and horses to protect their livestock and encourage reproduction. Before embarking on a hunt, tribesmen would perform a ritual that involved placing a variety of fetishes in a clay pot, sprinkling them with medicine, and saying a prayer over the contents. The hunter would then select a fetish to carry over his heart in a buckskin satchel. 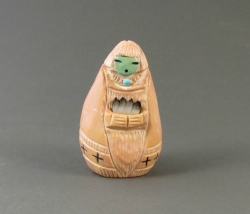 There are countless examples of Zuni fetish jewelry and carvings being used in these types of rituals. Discerning collectors choose Southwest Silver Gallery because they recognize our unwavering commitment to quality. Each and every one of our fetishes is worthy of even the most discriminating buyer, yet we keep our prices surprisingly low. Additionally, we work tirelessly to ensure the complete satisfaction of our customers by providing outstanding customer support at all times. Buy Zuni fetish jewelry and carvings with absolute assurance. We make ordering high-quality Native American jewelry and accessories convenient and secure. If you would like additional information about any of our fine products, or if you would like to speak to a customer service representative for any reason at all, we encourage you to call our friendly expert staff at 1-888-476-4367. You may also contact us online if you prefer. Don’t waste your money on fake products. Buy authentic Native American jewelry for less at Southwest Silver Gallery.